Jesus celebrated the Passover dinner with his disciples on Thursday night . Matthew, Mark, and Luke provide details about the dinner preparations (see Matthew 26:17-20; Mark 14:12-17; Luke 22:7-16), while John’s account starts with the Passover dinner already in progress. Jesus knew that the time had come for him to leave the world. But at this time Jesus taught and demonstrated his love for his own. “He loved them to the end”, meaning that he loved them fully, perfectly, and completely. During supper, when the devil had already put it into the heart of Judas Iscariot, Simon’s son, to betray him, Jesus, knowing that the Father had given all things into his hands, and that he had come from God and was going back to God, rose from supper. He laid aside his outer garments, and taking a towel, tied it around his waist. Then he poured water into a basin and began to wash the disciples’ feet and to wipe them with the towel that was wrapped around him. The dirt roads would have been muddy from the spring rains and most wealthy houses would have had a servant available to wash the feet of guests as they entered the home. There was no servant in the room that night and none of the disciples stooped to do this menial task. It was a major faux pas to be at the table with dirty feet, yet none of the disciples would wash their own feet, let alone the feet of each other. The disciples were preoccupied with asserting who was the greatest (Luke 22:24). Who would have the greatest positions in the Messiah’s Kingdom (Matthew 19:28)? Who would have the best places at the table (directly to the right and the left of the master)? Jesus demonstrated his love for the disciples by stripping down, taking a towel, and proceeding to wash each of their feet. Jesus, knowing that he was divine, knowing that he had total authority, washed their feet. He even washed Judas’ feet — the one who would betray him! Jesus replied to Peter that he must let him wash his feet if he wanted to have any fellowship with him. Note that Jesus did not say “you have no share in me”, but “you have no share with me”. Peter would always be a child of God (John 10:27-30), but he could not be with him unless he allowed the Lord to wash him. The first washing is to bathe the entire person and does not need to be done every time. For example, you would not take a bath every time you got your hands dirty. The Greek word is λούω (loúō), and means “to bathe the whole person”. This is the washing of new life in Christ Jesus (see Titus 3:5). All who believe are clean (John 1:12, John 3:14-16). The second washing is to routinely clean the parts that are needed. We wash our hands before we eat, and in the first century, you would wash your feet before attending a formal dinner. The Greek word is νίπτω (níptō), and means “to cleanse, especially the hands or the feet or the face”. We need this repeated washing in order to have fellowship with Jesus Christ (1 John 1:6-9). This is the cleansing that restores us when we go away from God. The first washing was new life in Christ (John 3:3). Not all of the disciples were born into this new life, as Judas would soon leave to betray the Lord (John 6:70-71). The second washing was fellowship with Christ. All twelve of the disciples were washed by Jesus Christ that night, including Judas. Jesus explained his object lesson on humility. The disciples were struggling for the best seats because they wanted the most leadership. But Jesus was showing them that the one who leads the most is the one who gives himself away the most. Note that this was not a new ordinance to follow. 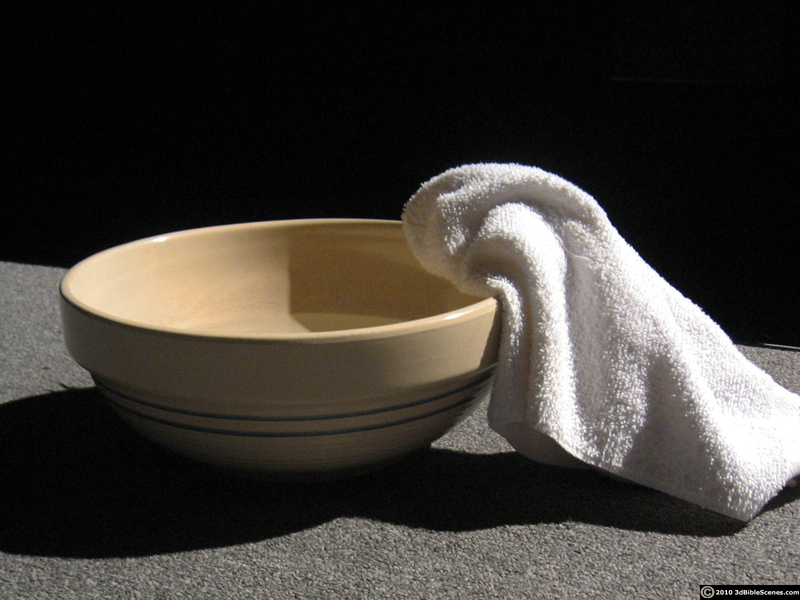 Jesus was not instituting a foot-washing ceremony but was instead setting an example of how we should humble ourselves. If our Lord and Master humbled himself, we should also do likewise (see 1 Timothy 5:10 as a specific example). Jesus was teaching this lesson to eleven of his disciples. He knew clearly that the twelfth disciple, Judas, would betray him that night. Jesus directly applied the example of betrayal (Psalm 41:9) to Judas. The faith of the disciples would be severely shaken. All but one of them would desert their Lord Jesus Christ in the face of his torment and death. So Jesus reassures them now. He knows what is about to happen. They need to understand that he knows it. At the hour of crisis, they can fall back on this and know that he is God. Literally, He says, “when it does take place you may believe that I AM”. But there is also a second reminder. They have a commission from God the Father. As the Son has represented the Father, so they will represent the Son. “Your authority is Mine, as Mine is My Father’s”. Practically speaking, the Passover was a two-day event. The northern Jews (including Galilee) would celebrate the Passover on Thursday, while the southern Jews (including Judea) would celebrate the Passover on Friday. The Galileans considered the day from sunrise to sunrise, and would celebrate the Passover from Thursday sunrise to Friday sunrise. The lambs would be slaughtered on Thursday and the dinner eaten on Thursday evening. The Judeans considered the day from sunset to sunset and would celebrate the Passover from Thursday sunset to Friday sunset. The lambs would be slaughtered on Friday (while Jesus was on the cross) and the Passover dinner eaten on Friday evening.